MIRI – Save Sarawak Rivers Network (SAVE Rivers) view the actions of the Sarawak Forestry Corporation enforcement officers (SAPU) together with the police to collude with a company doing illegal logging to dismantle the blockade at KM15 Long Kesseh, Baram as plain disgraceful. What is more shocking is that the one of the officers from SAPU by the name of Ahsan Odau claims he has the authority to dismiss the native customary rights (NCR) claims of the Kayan community of Long Kesseh, that the logging company has absolute rights to log the area and order the police to arrest the Baram Dam protesters that erected the blockade there. Yesterday, at the Miri Sessions Court, one of the managers of M.M. Golden Sdn. Bhd., Teng Yek Foo, and a boat operator, Laseh Seling was found guilty of trying to bribe the Malaysian Anti Corruption Commission (MACC) officers to not report their illegal logging activities at Long Kesseh. M.M. 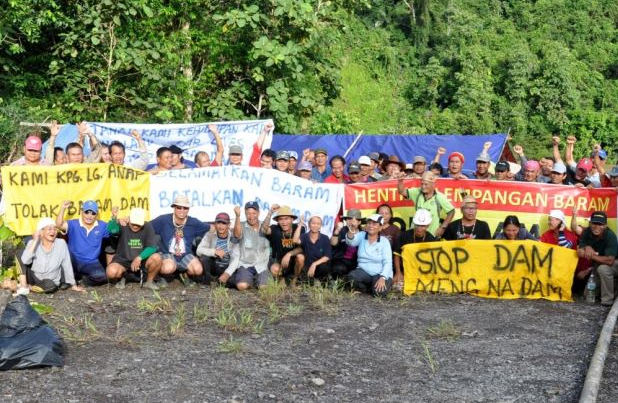 Golden was extracting Tapang and protected species of trees within the area of Long Kesseh, especially at the proposed site of the Baram HEP Dam without the proper permit from the Forestry Department. M.M Golden is the sub-contractor to Autorich Sdn. Bhd., which claims to have the licence to log the said area, but now this so called logging license of Autorich has come under question as to how the Forestry Department can issue a logging licence over logged over areas without an Environmental Impact Assessment (EIA) done, as required by the law. SAVE Rivers once again strongly demands that M.M Golden and Autorich and/or its agents and/or contractors to immediately stop their illegal logging activities and leave the site. SAVE Rivers also strongly demands that the Sarawak Forestry Department and the Sarawak Forestry Corporation cancelled any permits or licence issued to Autorich and/or its contractors and/or agents that is overlapping over the NCR lands of the community at Long Kesseh. SAVE Rivers demands that action be taken if M.M. Golden and Autorich if they are logging illegally at the said area. In connection with the illegal logging and endorsement by the Forestry Department, represented by their officer, Ahsan Odau, a police report and complain to the Malaysian Anti-Corruption Commission in Miri was made by Anyie Eng from Naha’ on the 28th Oct requesting the authority to investigate the illegal said illegal logging and the involvement of the Forestry Department. For further information, contact Peter Kallang, 013-8331104 or Mark Bujang, 014-8776685. Sarawak PKR deputy chairman See Chee How (centre) with Paul Malone (left) holding his book 'The Peaceful People: The Penan and their fight for the forest' and Lukas Straumann with his book 'Money Logging: On the Trail of the Asian Timber Mafia' at the joint book launch in Kuching. – The Malaysian Insider pic, October 30, 2014. Sarawak strongman Tun Abdul Taib Mahmud who is the subject of a new and unflattering book, “Money Logging: On the Trail of the Asian Timber Mafia”, has launched legal proceedings to stop its international launch and sale. Taib, the former chief minister and now the Yang Di-Pertua Negeri, instructed his London lawyers in the firm Mishcon de Reya, to stop the launch, said the book's author Lukas Straumann. Straumann said in a letter to his Swiss publisher, Bergli Books, that the law firm had stated: "If the book is published in English by a reputable publisher, it will cause colossal and irreversible harm to our client's reputation". Mischon de Reya said the book "accuses our client of being a 'despot'; having committed crimes; earning billions of dollars illegally from the timber trade; hiding that fortune abroad through sham companies; committing 'one of the greatest environmental crimes in history'; being a 'corrupt autocrat'; breaching international laws and regulations; using his profit from logging to feed corruption; and finally, having 'liquidated a forest in order to keep himself at the helm of a state". “Taib's lawyers are asking Bergli Books not to publish the book", said Straumann in a statement this evening. Straumann, a director of Swiss environmental group Bruno Manser Fund, said a similar letter was sent to the internet-based company Amazon UK, demanding that Amazon "will not distribute the book". The Swiss environmentalist said he is refuting Mishcon de Reya's demands and stated that “he will not retract a single word as the book has been meticulously researched and is strictly fact-based”. He said Bergli Books had also assured the Bruno Manser Fund that the book will be on the market as agreed upon. Amazon did not react to the letter and were still offering the book for sale, Straumann said. Despite the legal threats, the international book launch in Yokohama, Japan, on November 3, “will go ahead as scheduled”, he added. The launch is to coincide with the 50th session of the International Tropical Timber Organisation (ITTO). Nine other cities – Ottawa and Vancouver in Canada; San Francisco and Washington DC in the United States; London; Brussels in Belgium; Basel and Geneva in Switzeland – will also host the book's launch. The 10 cities, he said, were the cities where Taib and his family reinvested their alleged illicit proceeds from the state's timber trade. Straumann made a surprise launch of the 300-page paperback in Kuching yesterday. The book was presented in a joint launch with Australian journalist Paul Malone’s book "The Peaceful People: The Penan and their Fight for the Forest". The launch was witnessed by Sarawak PKR deputy chairman See Chee How. – October 30, 2014. A new book ‘Money Logging’, to be launched in Kuala Lumpur today, exposes the greed that has fuelled the destruction of forests in Sarawak which Mutang Urud calls ‘home’. One of the greatest environmental crimes in history, the issue, said Mutang in the book’s foreword, is more than just the theft of trees. “Surely, if my people have lost their ecosystem, their traditional way of life, their clean drinking water, and their freedom to roam the forests, they must have gained something. Yet they haven’t. “Many of the people of Sarawak are as poor as they were when I was born. “And yet, the value of the trees that have been felled is estimated to exceed US$50 billion,” Mutang wrote. He alleged that the profits have fed corruption, kept oligarchs in power, and used to commit further crimes. Mutang claimed that fortunes have been moved through the world’s leading financial system, most secretly, to places as distant as Zurich, London, Sydney, San Francisco and Ottawa. The book, written by Lukas Straumann, executive director of Swiss-based Bruno Manser Fund, charts the trail of businesses and investments linked to logging wealth. “It is also about power, more precisely, how a corrupt autocrat has liquidated the forest in order to keep himself at the helm of a state. “For my people, it is also more than a question of trees. It is about our culture they have stolen,” he claimed. As a young adult in 1970s, Mutang watched the loggers not only destroy the forests, but also divide communities with bribes and pay-offs. “They were like thieves in the night; indeed, they were working in such haste that their machinery could be heard at midnight, even on Sunday. “Our ancestral land has been desecrated, our history erased, the very memory of our origins lost. “As a young idealist, I could not stand by while this crime was occurring. In the 1980s, I helped organised blockades to stop the bulldozers and chainsaws. “I founded the Sarawak Indigenous People’s Alliance as a rallying point for our people’s resistance,” wrote Mutang, who went on a global campaign on this issue. “Back in Sarawak, the police attacked our blockades and sent many people to jail. I was arrested, interrogated, and held in solitary confinement. “Upon my release, I left Malaysia to speak about these environmental crimes at the Earth Summit in Rio de Janeiro and at the United Nations,’ he wrote. Fearing arrest, Mutang spent 20 years overseas, and upon returning, saw the rainforest he loved almost gone. The big question for him “is how a single man, along with a small group of very rich politicians and businessmen, could destroy the richest ecosystem on earth despite not owning it, despite local and global outcry, despite international laws and regulations. “Simply put: Who has stolen our trees?” he added. ‘Money Logging’ was launched by Batu Lintang PKR assemblyperson See Chee How in Kuching on Wednesday. The book’s Kuala Lumpur launch is today, to be followed by events in Japan, Canada, the United States, the United Kingdom, Belgium and Switzerland.